I4 beyond the ultimate: boondoggle or blessing? DISCUSS! Have they expedited the timeline ? I'd always heard 2021-2022. This says complete in 2021. If there will be Lexus Lanes, I expect Corbusian Radiant City Service Plazas with abundant 7-Elevens! Ultimate is 2021. Everything I had heard said 2021. BEYOND is like something ridiculous like 2027??? I'm not sure. It is supposed to start in 2019. In all seriousness, I think I-4 should be built as a triple-decker. Imagine how big-city we would all feel then! All our petty insecurities about our city would be instantly washed away. Go tall or go home. Shot from Andersen St. ramp. 408 Interchange progress. The 3.5 miles south of the ultimate project from Kirkman to 528 has been accelerated and 2021 is the is the target completion date, only about a half a year behind the rest of the ultimate project. This addition will allow the Grand National ramps that are already built to open really only has added one bridge/interchange, Sand Lake Rd on top of 528 itself, which I imagine is at least partially part of the current project there? Beyond that we are looking at a long time. The Sand Lake Road/Ultimate project has a lot of work associated with it. I dread going to my parents house now because of the traffic. I hate to see the MOT for that. Does anybody know why I-4 Ultimate is making the highway so high up now? Is there a reason for that? To be less of a barrier on a walking level. The idea is to connect everything again with the Under-I as a catalyst, and the sports venues, MEC, and Creative Village as the drawing factor. I like the general idea and the overall plan, although it seems to be gentrification of the Parramore and Callahan areas with a bias toward moneyed interests as opposed to people who actually live in the area and the future of the residents or students. I think part of the reason is the level the highway out in general, hills and valleys, while not dramatic, can increase traffic as people slow down because they can't see what's over the hill. The vertical curve of the highways have specific height/slope requirements for the speed. The new speed limit through downtown will be 60 mph which requires flatter curves. Also tying the ramps to the highway may be part of it. 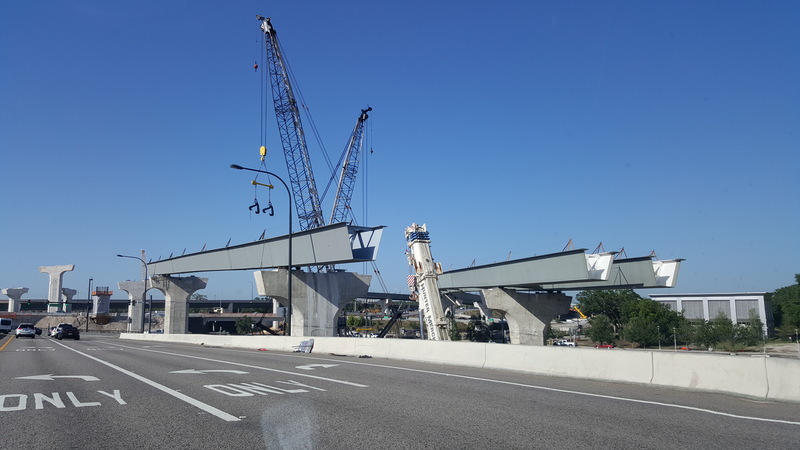 SR 408 will have direct access ramps flying every which way through downtown. The current high piers isn't even their final form. FYI, the redo of the US 92/I-4 interchange in Daytona- the i-95 overpass is noticeably taller than the old bridges. It makes me wonder whether they eventually want to increase the max height of semi-trucks on US roads....dunno. Since the construction began several years ago, I had been using 92 as a shortcut to I-95N. When they flopped the 92 left exit to the correct side it completely threw that off for me. I was lost as to where I was on I-4!!! I-4 North of SR 44 and I-4 South of SR 528 officially has space for HSR in the median as of right now. It used to be as far down as Lake Mary, but they've taken it out. Lawmakers in NC are trying to get rid of I-77 toll lanes in Charlotte . . . before they even open. I don't know if the plan will succeed, but they deserve credit for trying. In other toll-lane news, toll lanes in D.C. have sometimes charged as much as $45, for a one-way trip. Will anyone in Orlando be willing to pay more than a few dollars? I certainly wouldn't. The way congestion tolls work, if nobody is willing to pay the price the toll will drop within a few minutes to a price people are willing to pay. Congestion tolling, just about everywhere, has been shown to increase throughput significantly, and in the case of some lanes being free and some lanes being tolled, its also been shown to increase the average speed of the free lanes significantly, so that case really is just a win-win situation for everyone. Would I be willing to pay more then a few dollars in Orlando to get around faster? Depends on where I'm trying to get. If I'm running late to expensive show tickets at DPAC, or there is an emergency at work where a bunch of people are stuck unable to work and its costing me many dollars per minute, or if I'm running late to a flight and don't want to risk missing it, sure, I'd be happy to have the option to pay more then a few dollars so I don't end up losing even more money. If I'm not in a rush, just going out to dinner, doing everyday tasks, etc, I wouldn't. Thats how its supposed to work, allow those for whom it is really important to get where they want to go to get their faster, and help subsidize costs for those who are willing to go a little slower in exchange for not paying so much. The toll'd express lanes with free general use lanes really seems completely ideal for everybody. Orlando has already shown people are very happy to pay premium pricing to avoid waiting, especially with all the tourists. Disney charges $45 per day to park in premium parking and $22 for standard, lots of people are willing to pay that $23 premium for a better spot. Universal charges a $10 premium to park without having to use stairs/escalator/elevator to get to the parks, and a $25 premium to be closer. A lot of people don't use Disney's free magical express service because of the time it takes and to save 20 minutes can easily pay $50 for a Mears taxi or ride sharing service or upgraded individual accommodation. With people in our area paying all these premiums constantly, you think people wouldn't pay more then a few dollars to get by on I-4 faster? I agree 100% aent. Studies on these have proven conclusively that it helps everyone. The people unwilling to pay even benefit greatly because of those that are willing to pay. Having used it in Miami because we were running late, I gladly paid the price. I am very frugal with my money and even then I recognized the benefit. The single best piece of the pie is this is 100% a choice for the consumer. If you travel on I-4 every day today and continue to do so when congestion tolling arrives, you don't have to change ANYTHING in what you do. You never have to use it. If other people do or don't, you are not required to. Ignore it. Pretend it doesn't exist. Just do what you always did before. You are not losing lanes. You are not getting additional cars beyond normal growth. You are punished in no way. You are more than likely going to benefit, but you can pretend you aren't. You can angrily yell at clouds because you are stuck in traffic. You can angrily yell at clouds about the radio station. You can angrily yell at clouds because you are an angry person who hates clouds and hate not having more to yell about. I understand the arguments for toll-lanes. Obviously, people can use them in a rush. And I don't dispute that tolled lanes help with traffic congestion. In fact, I don't disagree with anything said. But many other cities have major highways that are not tolled. With the I-4 Ultimate project, EVERY highway here locally will be tolled. I understand drivers can choose or not choose to use the tolled lanes. By why is everything here tolled? It's a tax on drivers. Everyone is proud of FL's low taxes. A $5 one-way trip back-and-forth home daily (22-24X/month) is a nearly $3,000 tax per year. That $5 figure is likely conservative. I remember people were upset when the East-West Expressway tolls were raised. By 50 cents. I've honestly never heard anyone argue FOR higher tolls. Let the state and federal governments contribute more to local highway projects. It has happened in every other city . . . since the Eisenhower administration. We are not a second-rate city undeserving of our portion of public spending. We were told a non-tolled I-4 expansion would cost too much. People often make excuses for a second-rate (maybe third-rate) transit system. Anything else would be too expensive. Why would anyone EVER take that position? It sells our whole city short. If we are going to think like that, we will never get anything. It's another example of having really low expectations, while other cities DEMAND more. "Has Trump Irreversibly Altered the GOP's Foreign Policy?" SAY WHAT? What could that possibly have to do with I4 and Lexus Lanes? Oddly, they're related. The above article by Ron Brownstein in The Atlantic notes that the Trump administration has decided to tear apart the Western alliance and all of the agreements cobbled together since the internationalist Eisenhower administration won out over the isolationists in the Taft wing of the Republican Party. But that's not the only big decision made back then. The Eisenhower folks also created the interstate system, the largest public works project ever seen, to be funded primarily by gas taxes instead of tolls. It wasn't a new argument then and it certainly isn't now. Coming out of the Great Depression and World War II, there was a consensus that we were all in this together. CEOs were entitled by consensus to make maybe 50 times more (unlike today's 180+ multiple) than their blue-collar employees, but the working stiffs were also entitled to look forward to owning a home and being able to send the kids to government-funded state universities. All of that held sway until the 1980's and the ideological wing of the GOP worked with the business interests to change the rules. Whether it be big pharma, middlemen taking huge profits on student loans, huge parking fees from privatizing meters in Chicago and sewers in Birmingham and, yes, tolling portions of statutorily guaranteed to be free interstates, there was money to be made in public finance. How was it justified? All of a sudden a meme went out courtesy of ALEC and conservative media that people simply wouldn't make the investments required anymore. Unfortunately, the academic remained in its ivory tower on this and remained complicit. There is certainly a case to be made for congestion pricing, but it needs to be limited to highly congested downtown urban areas, not broad swaths of an MSA. Reality is absolutely correct (think about that for a moment, we're in agreement) that the sweetheart deals made between multinational firms and legislators are being paid for on the backs of working men and women, whose wages are already stagnant. The irony of course is that in the long run, we're paying more. Have you considered how much more complexity is involved to redesign I4 and its some tolled, some not Lanes and their connections to off and on ramps as compared to simply raising the gas or sales tax and adding a lane or two? But then, that's OK too, because investment banks can make even more inflated interest and fees on the additional spending? And for the transit types, that's money that can't be allocated to spending on bike lanes, buses or rail. It's a shell game in which only a few will benefit. Where I disagree with Reality is that this was not a game engineered locally. In Florida, the major roads are controlled in Tallahassee and Orlando, as the newest and smallest of the major MSAs, doesn't control the process. That has to take place statewide. Change Tallahassee in order to get real change in Orlando. Fairly urgent: Can anyone document the old Van Atta Connector plans? I was sure that I had read about this before, but on searching the web for good sources, I came up surprisingly dry. Can somebody who follows this stuff edit that page to link out to a source or two, then remove the prime-for-deletion tag? 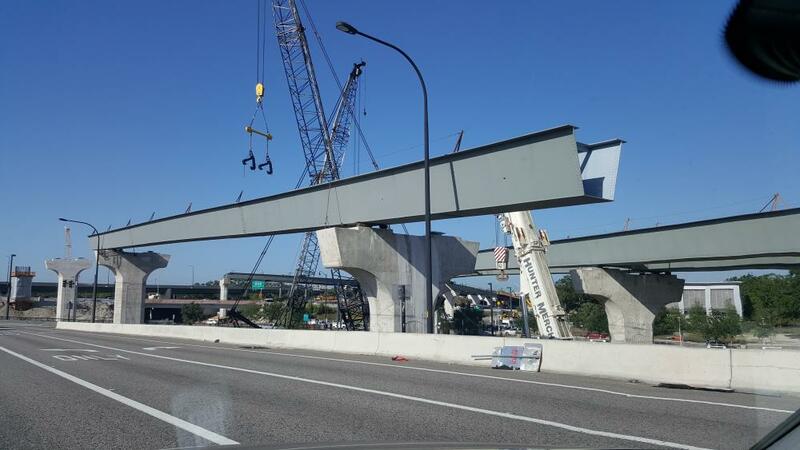 This article is several months old but gives a nice overview of the current project on I-25. I kind of laugh at the "July 2013" completion date as I'm not sure they even have a chance of completion before the end of the year - but miracles can happen, right? Anyone have an idea what they're building behind the StudioPlus hotel at the intersection of Kanis Rd and Shackleford Rd? The lot was wooded but they have cleared it off and have put down a gravel base. Thanks! Statesboro seems to be bouncing back for some industry sectors - particularly multi-family construction as four major projects are now underway. One project is currently under construction, while three others are slated to begin construction in 2012. Hopefully these new projects will provide a multiplier effect for other industries to benefit as well. Several things have probably contributed to these new development - Georgia Southern University's explosive growth is definitely one obvious factor as the school has surpassed the 20,000 enrollment mark. Other local colleges have also surpasses previous enrollment records including East Georgia College which is currently building a new campus in Statesboro, as well as Ogeechee Technical College which is likely looking at major expansion soon as well (I understand they have broken their previous enrollment records). The Forum - 780 bedrooms - is a luxury apartment complex by Boca-Raton based Parkland Development Corporation currently under construction in on Old Register Road. The complex will feature 1/1, 2/2, 3/3, and 4/4 bedroom/bathroom layouts. This complex is obviously geared towards students and is expected to open in Summer 2012. I don't know much about The Monarch Douglas - 450 bedrooms, except that the name is very strange in my opinion. The Varsity Lodge - 500 bedrooms - sounds exciting to me because they will be demolishing a worn-down complex with the same name and rebuilding new 4-story units in the same location. Out with the old and in with the new. The current blighted property was foreclosed for good reason considering its terrible dis-repaired conditions. Personally, I think the location is the residences is a bit odd and would rather it be used for something else as its off the beaten path, but for the sake of density, I can complain. Aspen Heights - 800 bedrooms - sounds like its going to be a hott sprawled out mess, and future blight property from the layout as I understand it. I have not looked into this property (and I will later) but it seems like a terrible design just considering its dimensions. From what I understand there will be 213 separate buildings consisting of 2, 3, and 4 bedroom units - ughh. Other developments for Statesboro include a new Hampton Inn locating in the Market District. Some leaders are trying to create a TAD near the interstate for a new industrial park. There seems to be some undisclosed major development occurring on one of the already-congested highways. Georgia Southern is also getting a New York Pizzaria - Im not sure if that is a generic working name or the actual name of the eatery.